The launch of music tracks free of digital locks on iTunes has been overshadowed by the discovery that they contain data about who bought them. Some fear this data could be used to identify the owner of the tracks, if they turn up on file-sharing sites. The tracks from record company EMI cost more and are of a better quality than standard iTunes songs. Apple has yet to comment on what it plans to do with the information embedded in the music files. The tracks without the digital locks, known as Digital Rights Management (DRM) technology, officially went on sale on 30 May under the iTunes Plus banner. The downloads cost $1.29 (99p in the UK) rather than $0.99 (79p in the UK). Apple uses a technology known as Fairplay to limit what people can do with downloads. Fairplay can be circumvented by burning tracks to a CD and then converting them to another format. News site Ars Technica was among the first to discover that downloaded tracks free of Fairplay have embedded within them the full name and account information, including e-mail address, of who bought them. It suggested that this information could be an anti-piracy measure as it could help work out who was putting downloads on file-sharing sites. It was not clear, said Ars Technica, whether the data was part of Apple's administration system for iTunes or something else. It said because the data was easy to spoof Apple needed to explain why the data was present. The BBC has contacted Apple seeking comment but so far the company has made no official response. Other websites said it was only a matter of time before a utility program was produced which could strip out the identifying information. At this point it is not yet clear how deeply the user data is buried in the track or how easy it is to remove. EMI's decision to sell DRM-free tracks was announced in April. At the launch event Apple boss Steve Jobs announced that the iTunes store was the first to sign up to sell them. 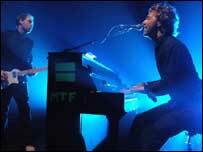 Tracks by artists such as Coldplay, Joss Stone, Frank Sinatra and Pink Floyd are available without DRM technology. The EMI/Apple move followed an open letter penned by Steve Jobs in February that called for music companies to release tracks without digital locks.